Latest appearance Doesn't matter, really. Hi, there! The name 'ere's Mashunopio and I like art and games! The things I will be working on will be shown here. This user dislikes these three games. This user is a fan of Mario RPG titles! This user's favorite Mario RPG is Mario & Luigi: Superstar Saga and its remake. This user thinks Toad and Toadette's friendship is pretty cool. This user is doing the Fawful. 7 Log 54: Rumors and Typos and Hope, Oh My! 16 Log 63: How Great is Mario Maker 2 and What’s Worse Than Morton’s Malatone Tragedy? 18 Log 65: Did I Change Nintendo? Though dark and all, this game had all the remarks of not having to waste time in turn-based battles. Furthermore, I had completed the whole game at 100% a few years back. This game marked the birth of my likeness of the Mario & Luigi series. This game is how my strong likeness for Toadette began. The second game I had liked. It may have Toadette in it, but the whole storyline was bleak. WHERE'S THE ELITE TRIO IN THIS GAME WHEN YOU NEED 'EM?!?! This game featured new Amiibo and new 2D artwork. No remarkable traits about it, though. I enjoy this game soooo much that I beat the game from start to end again and again. Loved this game as a kid, but this game is byfar way too painful to play since there were a couple of tears at some points of the game. This game I had to bail out on cause of Archivist Toadette. This game's side story was the WORST thing I have ever played! ...apart from those three chumps. They're kinda cool. WARNING: This is about me going over some family issues that are hard for me to face for a day. Don't blame my anger for any of this, okay? So you thought this was a three-parter, huh? Well, YOU WERE WRONG!!! MY F-BOMBING BROTHER IS AT IT AGAIN WATCHING WHAT I WAS TALKING ABOUT BACK IN LOG 22 AND YOU KNOW WHAT I'M GONNA F-BOMBING GET FOR HIM DOING THAT?!?! I'M GONNA- (takes deep breath) You know what? I've got nothing else to say here. All I'm gonna do is post that icon of an angry Donkey Kong. (pants) Sorry. I'm not feeling myself today. My brother is doing that dogram boat AGAIN!!! Sometimes I don't FLANNING KNOW WHAT TO DO WITH THAT CHEEK-FACED BROTHER OF MINE!!! I...I feel like I'm starting to lose it all over again... W-what else could go wrong. Still grieving over the fact that Toadette will “never be in another Mario game again”, though I’m kinda depressed over it… So in order to make up for it, I decided that I should get Super Paper Mario. Besides, I used to play this from 2014 all the way towards 2016…and I’m (probably) gonna do it again! Anywho, I tried playing a ROM version of the game on Dolphin 5.0, but right when the scene where Mario & Luigi set off to Bowser’s Castle in the beginning of the game, it crashed. I mean, ROMs just don’t work as good as you think. However, I was able to look into the files and look around, but then I found those script files. Thankfully, all of them were TXT files, so it’s easy to look at every little inch of dialogue. Look out, Mariowiki! A list of Super Paper Mario tattles is coming soon! Log 54: Rumors and Typos and Hope, Oh My! 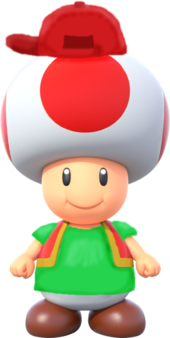 I just don't understand WHY... Why do people talk about Toadette "not really a Toad"? Basically it's a form of Toadette. I mean, it's like people are now thinking, "Oh no! Poor Toadette, cursed by Kamek!" or "How long have you been cast under this spell?" I mean, I'm a little happy that the whole Captain Toad thing is starting to fade away. I'm just bewildered over the three theories. 3. Toadette not really Toadette. I mean, I'm a Nintendo kinda guy, and I find all these theories preeeeeetty false to be honest. I mean, I'm fine with Toadette being in NSMBUD, but what concerns me is that I've been trying to fill in for the Super Paper Mario bestiary. Right on the point when I was editing, I accidentally made a little error, and I knew if I left it like this, I woud be blocked indefinitely. I mean, one little accident is basically vandalism if you're not careful enough. Remember users: Be careful of what you're editing, or you'll be in serious trouble! People just keep going on, blabbering about Bowsette, this and that, here and there. What’s worse is that it is an official thing now! There’s no stoppin’ this meme now! I mean, just thinking about it makes me ANGRY! Sometimes, I just think that the parodies are a step way too far. You know what I mean, right? Oh, the fanfiction lore of Bowsette is KILLING me! I just wish people can accept this looney crown to be only available to Toadette. I mean, you know how people kneel on making genderbend characters, such as in an “anime” appearance. Besides, I’m starting to think this whole Bowsette thing is getting out of hand from the last month. I think it’s time to put this meme down the drain. This HAS to stop, like RIGHT. NOW. Ya know, something like, Super Mario Glitchy Four, that’s what it’s called? Anyways, you ever know about SMG4? Why, yes of course! It’s the funny Mario stuff with all the body-tossing, randomness and whatnot. It’s been giving me laughs…well…until early 2018’s videos… It’s like no one seems to care about funniness, or…was it that YouTube is being rejectful over them stupid policies about insulting Italians? I like all the wacky jokes! I mean, why they gotta trash ‘em on the modern videos and make it uptight and emotional? That’s just wrong! And sick at the same time! I just wish these dumb arcs would end and then just make more ideas! Like, say, another SSENMODNAR? There’s NEVER gonna be a SSENMODNAR 13…since…13’s an unlucky number? Yeah, no SSENMODNAR 13 for SMG4 fans. It’s gonna be like Paper Mario being revamped into a paper-y world with just Toads as NPCs. I just can’t stand the fact that 2018 has let me down. I just lost my smile and now I feel ULTIMATE-ly depressed. Get it? “Ultimately” as in “Ultimate”? Speaking of “Ultimate” they never had her normal appearance… I’M IN TEARS RIGHT NOW!!! BAAAAAAAAHAAAHAAAHAAHAAAAHAAAAAAAAA!!!! BAAAAAAAAHHHHHHHHH!!! WARNING: This is how my depression curcuit officially ended. Seriously. Logs 41-57 are definitely sad for me. You know, major complaints, wishing for that to change, etc. Seriously. I've had a hard end of 2017 and entirety of 2018. If you wish to read this, then go ahead. I don't mind if you read it. I feel like a fool just saying I wanted to throw away my love for Mario; I was just upset about Treasure Tracker and I'm glad that New Super Mario Bros. U Deluxe and Bowser Jr.'s Journey will change everything. Guess things are starting to get better within the beginning of the year, huh? No Masked Mashers of Mayhem, no Marauder and Jake, no million gold coins, none of all this cruddy disaster. It’s come! The year of misery has ended! Now it’s the year of CHORTLES!!! Sorry. I’m just overexcited over that new Bowser’s Inside Story remake. Besides, other than the Toads and the Shine Rank being replaced with the Boomerang Rank thus the big switcheroo with the Flower Rank, every single element in the game seems to be irreplaceable! Am I right? Anywho, this whole SS thing was Google Translated by me, and you wanna know what it read? That’s right. “SS Company”: The other three followers of Fawful other than Midbus. I am bound to know the SS Company’s names, so apparently, everything’s just bizarre Japanese… So apparently, I can’t even play the game with such a symbolized mess! Anyways, let’s get straight to the hype for Toadette’s Crowned-up adventure rather than just Bowser Jr.’s; I’m saying that it may seem unparticularly boring, but I really wanted to see Toadette’s forms besides Peachette (I know, Peachette is a lot popular, could be something where imagination comes true for her). I was kind of disappointed that Toadette’s forms aren’t what they were expected to be, but they were kind of OK. I’m just glad it’s not another thing about tracking treasure. Some people say that Bowsette was killing off the Mario franchise (FYI, making it “canon”). Bowsette is like a bug spray, goshdangit! So, yeah. The bug spray will one day this year be thrown away in the trash, and next thing, it will be a discontinued brand of bug spray (dead meme if you catch my drift). I’m more excited about Bowser Jr.’s Journey AND New Super Mario Bros. U (ft. Toadette and a crown that turns her into a princess) than anything in the Mario universe! And forget everything I said back in 2018; that whole Tag Team Trouble nonsense is just ludicrous. I think 2019 will be an even BETTER year than 2018. FAW-FUL FAW-FUL FAW-FUL-FAWFUL!!! EVERY-BODY DO THE FAW-FUUUULLLL!!! To start this log off, I got some good news, and I got some bad news. Every Bowsette hater’s reaction after hearing that Bowsette herself is not canon. Nintendo has finally settled the whole fanfic lore over Bowsette, now the queen of all the Ugandan Knuckles for showing her “DA WAE” as they’d call it. Besides, this meme was extremely overrated and is an F- for the children-esque environment of Mario. Glad Nintendo doesn’t want any genderbend characters as part of the franchise’s agenda. Am I right? Stupid YouTube… How DARE you terminate SiIvaGunner?! You should be ashamed by your termination actions! You know how careful everyone is on YouTube! What’s wrong with adding a little fanmade remixes and making them into a song from a different game?! (EX: Deltarune, Mario Odyssey, etc.) SiIvaGunner (now under the channel “SiIvaGunner2” (trust me, the real SiIvaGunner is in this channel) is planning to do a Q&A of why YouTube has turned all his cool internet remixes into roundish rectangular faces with the “sorry” smirk. Well, I’m not claiming any adult-related content and there is no way I’ll ever do it! Thanks a lot YouTube. You just ruined a perfectly-good alt-song channel! It’s been about two whole weeks since those two new games were released. I enjoyed New Super Mario Bros. U Deluxe most because of how you can play as Toadette and get an easy rating. Nabbit (AKA Nitbit) is useless to me since he doesn’t REALLY complete the courses at all. I’m feeling a bit broken about Bowser Jr.’s Journey though. I will play a lot more, but there’s one part that upsets me to the point where it’s all Tag Team Trouble all over again. I don’t know about this, but there isn’t a lot of content acquired for Bowser Jr.’s Journey. Doesn’t anyone think Nintendo is too lazy to make new units other than Swoop (which is fully created)? What I wanna say is I kind of regret crying over Toadette “not being in a Mario game ever again”. 2018, I felt like my world was just falling apart. In 2019, however, things get better. I don’t know why, but I instantly regretted fullifying the TAOSMB3 quote list. I know, it’s embarrassing to me, but you’ll be amazed after a whole year worth of progress of how much effort I put into this. I actually don’t think adding cartoon quotes is a bad idea after all. I should add the Super Mario World television series quotes next. THAT’LL pass the time! Thirteen episodes! It’s been about four weeks (DOUBLE THE NUMBER I SAID IN MY LAST LOG :P) since those two games came out. At first, Bowser’s Inside Story’s new remake was outright BIZARRE! Bizarre enough to laugh at the Fawful Guys’s crazy dance moves. But…things just took a turn when I played today… I was so so so upset that I don’t think I respect the evil characters anymore. I’d rather abandon the evil characters outta my heart. If I hear anyone say something that they got past seeing Bowser Jr. eat the Charred Spicy Drumstick while crying, there’s gonna be a lifelong issue here. I mean please… Bowser Jr.’s Journey is just an emotional mess for me. Log 63: How Great is Mario Maker 2 and What’s Worse Than Morton’s Malatone Tragedy? The title of this log explains everything about these two questions. How great is Mario Maker 2? Why, yes! Not just Toadette being in the game, but a storm of new materials heading your way! I just can’t seem to know who this guy is supposed to be. It can take you up, yes, but the SMW version of it heavily references a miniature Ty-foo as it appears. I also can’t shake the feeling of waiting for a new trailer. Besides, I wanna see the details of the game and see how it goes! (I just hope Mario Maker 2 gets DLC.) Also, I wonder if this is canon: A Fire Bro/Sledge Bro hybrid enemy that you can turn a Hammer Bro into with a Super Mushroom and a Fire Flower. Slopes, Snake Blocks, new enemies…ANYTHING an upgraded level-making game would flourish! I wonder what the brand new elements for the game would be like? Find out soon at April! What’s worse than Morton's Malatone Tragedy? My gaming era’s WORST enemy! I just wish this game were to be done, done, DONE!!! Extended Mario 3D World adventures, some stupid mushroom-shaped skeleton, EVERYTHING ABOUT THIS KOOPING GAME!!! IT’S HIDEOUS!!! I mean, just thinking about the new content of multiplayer makes me wanna RAGE! Congratulations, Nintendo. I trusted you, and you HAD to spill the beans on a new update for this game! Good job for ruining my pride, Nintendo. Back to watching The Adventures of Super Mario Bros. 3 for me! I’m about 85% done with New Super Mario Bros. U Deluxe. I just beat Roy, I collected all the Star Coins throughout the Rock Candy Mines (with a couple cheats), and now I just feel like there’s nothing to do other than that cherished game. Am I missing internet patience? And why am I still bored to the core over the April 11th Nintendo Direct? I mean, do you only play as Mario in Mario Maker 2? Can you change characters? I mean, there’s gotta be more than just all this boredom hoopla goin’ on! Also, seeing Toadette in New Super Mario Bros. U Deluxe didn’t just make a whole purpose for my life, but it left me with several questions over my past deeds… Why was I severely depressed throughout 2018? Why was I filling in all those TAOSMB3 quotes? Did I just wanna constantly talk about how terrible Treasure Tracker was? Anyways, what’s Toadette without that crown, anyway? Just having her grab a Super Crown to become Peachette… Turns out I am quite used to that and I enjoy it. I am still quite ashamed that they’d make a Treasure Tracker out of how it started, but…that’s OK. I’m livin’ the dream! I just hope Nintendo would explain more about Mario Maker 2, the tornado thing, and a bunch of new, cool, undiscovered stuff I can’t recall! Get your level elements ready, cause this is where things will REALLY get creative! Log 65: Did I Change Nintendo? Honestly, I know 100% I’m real fond to the Mario canon. But thing is, since New Super Mario Bros. U Deluxe lifted my spirits with Toadette and the Super Crown that is usable only to her, was it an idea Nintendo ever came up with itself, or did I make Miyamoto the one to blame for Treasure Tracker and all that depressing nonsense I’ve blabbered over within last year? I mean, here’s my theory: People might’ve outdone the whole head-or-hat mystery over Toad in between the cartoon Toad’s own spotted hat and the real Toad’s own mushroom head, and one Nintendo developer might’ve stumbled right onto my Mariowiki userpage wondering how in blazes was going on. Next thing, he starts to feel sullen about my “Toadette’s never appearing in another Mario game again” lie. I mean, I know for sure that was a lie. And I didn’t really mean to be the big upset of the Mario fandom. This page was last edited on April 10, 2019, at 20:52.